The CUSCO front strut brace offers superior chassis rigidity compared to the OEM brace, light weight due to its aluminium cross member and steal skeletal tower frames, this handling upgrade off a sharper turn in feel while helping to reduce front end chassis flex in the suspension towers. This Front Strut Brace from suspension specialists CUSCO has a built in brake master cylinder stopper, This stopper applies force to the front of the brake master cylinder to prevent unwanted flex of the firewall under heavy braking. pair this with a set of braided brake hoses and you will really notice the improvements in positive brake pedal feel. This Strut brace is one of the very first upgrades we recommend to our customers when they are looking to improve handling and brake pedal feedback. An Excellent upgrade that wont brake the bank. This rear upper strut brace from Japans famous handling specialist CUSCO offers superb chassis stiffening at a price that wont brake the bank, Light weight due to its aluminium cross member (made from oval profile aluminium extrusion) and small steal suspension tower mounts. This CUSCO rear strut brace is an excelent partner to the CUSCO front Strut brace we also offer. This CUSCO kit has been compiled by Essex rotary as a great upgrade and overhaul for your suspension, selected to help stiffen your cars chassis, improve turn on and reduce body roll. Excellent for both fast road and track use. This kit includes the following items. CUSCO front strut brace with brake master cylinder stopper. CUSCO rear upper strut brace. 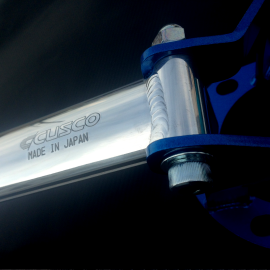 CUSCO 28mm front tubular anti roll bar. CUSCO 18mm solid rear anti roll bar. High quality OE spec replacement droplink set. The strut braces will improve chassis stiffness and turn on while the brake master cylinder stopper will improve brake pedal feel, combine this with the anti roll bar set to dramatically reduce body roll through the corners. To round this kit out and make installation a lot easier Essex Rotary also include a new set of our high quality drop links (set of 4) Cusco are world leaders in chassis and suspension technology with a passion for developing products that customers demand. Please allow up to 28 days for delivery of this kit. 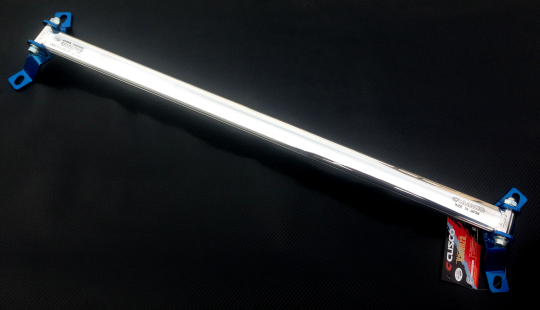 Popular on the RX-7 FD Ultra Racing brings you these 3 point Fender (inner wing) brace bars. 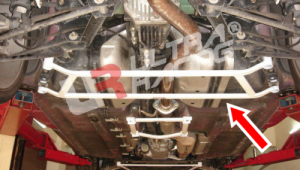 The theory is that with the use of these bars, chassis flex around the front strut towers is reduced due to the extra bracing offered by this strong 3 point fender brace . Please allow up to 28 days for delivery of this part. 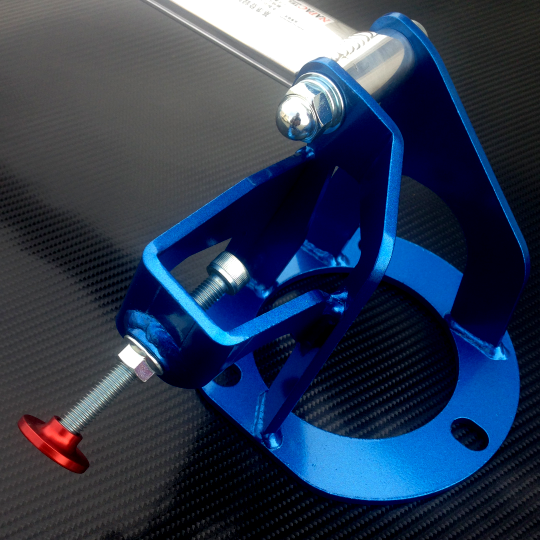 Adding additional chassis rigidity is UltraRacing's speciality, this front lower brace sits below the front subframe mounting to 4 key locations to help stiffen up your RX-8's front end. Please allow up to 38 days for delivery of this item. A great alternative to the 2 stamped metal center cross members found on the standard Mazda, these can often get bent out of shape easily. This lower middle brace has a 4 point mounting configuration that will help stiffen up your lower chassis better then the 2 OEM cross member plates alone. A great replacement if yours is damaged or a great upgrade that wont brake the bank. Please allow up to 28 days for delivery this part. This 8 Point lower chassis brace from UltraRacing will stiffen up the rear of your RX-8 reducing chassis flex by joining the lower part of the rear sub frame to the cars chassis more securely. Sold as a pair of 4 point braces one left side and one right side. 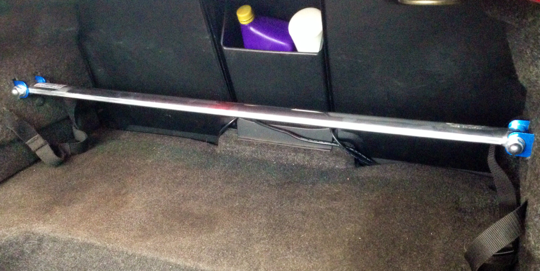 Rear lower strut bar installs across the floor of your boot space to provide increased rigidity between the rear suspension towers. 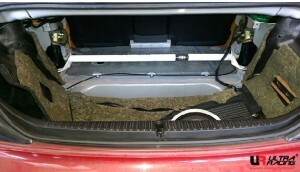 Many customers have reported good results with the use of a lower rear strut bar on track. Adding additional chassis rigidity is UltraRacing's speciality, this rear lower brace sits below the rear subframe mounting to 4 key locations to help stiffen up your RX-8's rear end.